Speed: 20 - 25 knots approx. With our in-depth knowledge of this domain, we are actively engaged in providing an excellent quality range of Plastic Motor Boat. The ride is breath taking and thoroughly enjoyable, grin to the thrill and the beauty of soaring hundreds of feet while you enjoy a birds eye view in a peaceful and serene world. 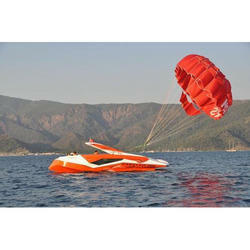 The parasail is stable so the passenger enjoys the ride without having to steer.